PenDelfin Barrow Boy designed by Jean Walmsley Heap and produced by the PenDelfin Studios from c1968 until 2001. This PenDelfin Barrow Boy is wearing blue trousers. 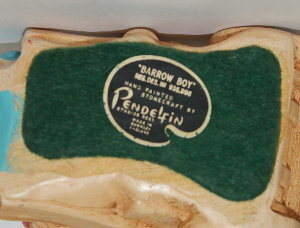 On his base he has his original green felt and PenDelfin artist palette, Barrow Boy, label. Condition: Excellent overall condition. A lovely PenDelfin rabbit perfect for the PenDelfin village - outside the PenDelfin Fruit Shop or Cobble Cottage!